December 2014 n Performance & Hotrod Business n 65 fortunate. We're one of the few smaller shops that does everything in-house, with engines and chrome work being about the only exceptions. All the upholstery and paint—it's all done here and customers love that." Despite the shop's award-winning history, Morey credits a great deal of his success on his focus on strong business fundamentals. With those fundamentals in place, a shop can better negotiate with customers on sensitive issues like pricing. "We have a good following of repeat customers and referrals and that's because we are very conscientious about always running the business as efficiently as pos- sible," he says. "Our customers know that we're not wasting their money. When it comes time to educate customers on the cost of this type of work, we can do that with confidence." Morey says keeping customers up to date with progress on a vehicle build is critical to maintaining their trust. Even on multi-year projects, the shop will docu- ment everything with digital photos, creat- ing a library of images to track progress. The shop sends regular email updates so the customer can see the project evolve over time. "If you work night and day but never show them the progress, they won't ever understand what it took to create a show- worthy car," Morey says. An Evolving Business With a 40-year history, Morey feels fortunate to have a unique perspective on his own business set against a backdrop of a constantly evolving industry. 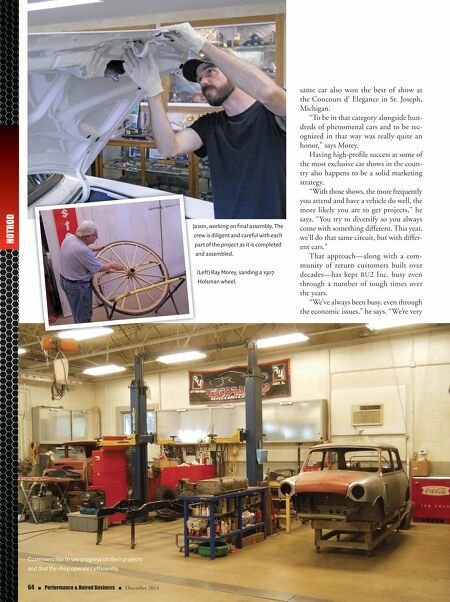 "In the early days we did more custom paint work and then we started building a couple of street rods from the ground up," says Morey. "As we grew, we evolved into doing almost strictly body-off work only. Over time we realized we didn't just have to do '30s cars; we love all cars. "We used to say we didn't want to work on anything newer than a 1947, when those cars were about 50 years old. Now, we still like to work on 50-year old cars, but those 50-year-old cars are muscle cars," he adds with a laugh. Halo top and trim nearing final assembly. FACT: 3 out of 5 cars have corrosive brake fluid! YOUR BRAKE SYSTEM IS ONLY AS GOOD AS YOUR BRAKE FLUID. 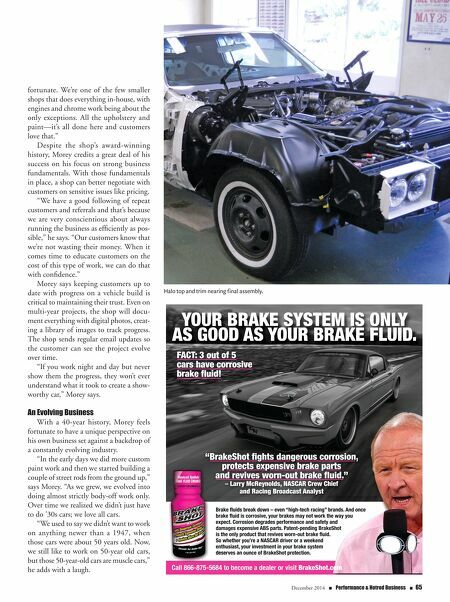 "BrakeShot fights dangerous corrosion, protects expensive brake parts and revives worn-out brake fluid." – Larry McReynolds, NASCAR Crew Chief and Racing Broadcast Analyst Call 866-875-5684 to become a dealer or visit BrakeShot.com Brake fluids break down – even "high-tech racing" brands. And once brake fluid is corrosive, your brakes may not work the way you expect. Corrosion degrades performance and safety and damages expensive ABS parts. Patent-pending BrakeShot is the only product that revives worn-out brake fluid. So whether you're a NASCAR driver or a weekend enthusiast, your investment in your brake system dese deserves an ounce of BrakeShot protection.